About The Eastern School of Fretted Instrument Repair. The main goal of The Eastern School of Fretted Instrument Repair is to provide a complete and thorough education in both basic and intermediate guitar and bass repair for our students. By providing our graduates with an in-depth knowledge of the lutherie trade, we are giving them the practical, hands-on knowledge needed to gain employment as a guitar repair technician (guitar tech) or, if they’re ambitious enough, to open their own guitar repair business. Many guitar repair schools promise to teach students how to build & repair guitars. More often than not, what actually happens is the student spends the majority of the course building one, two or three personal pieces, gaining some basic construction techniques along the way, and may spend 3 to 4 weeks on “repairs” at the end of the course. By not focusing on each individual aspect of the guitar tech trade in the proper context, the student will leave these programs without a thorough grasp on the guitar repair trade as a whole. This is not guitar tech training! In short you will learn how to “earn a living” in the guitar repair world by becoming an efficient, knowledgeable, and confident guitar tech. Upon graduation, we assist in any and all ways possible to facilitate leads into available guitar tech jobs. We have various relationships with a collection of both local and long distance repair shops that are consistently in need of capable qualified technicians. We provide graduates with all the information needed to understand the technical and business aspect of the trade, as well as commercial contacts used by working shops needed to succeed as a Luthier. The entire program runs 20 weeks (approx. 5 months). Your day will begin at 10:00 am sharp and instruction runs to 4:00 pm Monday – Friday. Students may stay from 4:30 pm to 6:30pm Mon-Thur. for independent study. Mr. Kyle Roggendorf , Dean of the Eastern School. Kyle has spent his entire life since the age of 24 in and around music and rock bands. Both as a player and a tech, Kyle has made his mark. Apprenticing with Mr. Joseph Civitano the founder of the school, Kyle learned the craft of guitar repair at the hands of a master tech. Dedicating himself to the perfection of his craft, Kyle has worked over the years with many bands and artists as a roadie tech leveraging his roadie guitar tech skills. Some of which include: The Gaslight Anthem, The Bouncing Souls, Odor Sister, Hot Water Music, Dave Hause, Armored Saint, Motor Sister, Scott Ian, John Tempsta, Jewel, Seven Witches, The Bronx Casket Company, famed guitarist Jack Frost, A Pale Horse Named Death, Dave Simmons, Overkill, Bayside, Boys Set Fire and Vision. 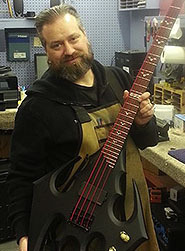 While Kyle hits the road ensuring these and other artists have the best quality roadie guitar tech work done on their axe’s while on the road, Mr. Eric Sisterhen, Senior Instructor at the school, holds down the fort and continues to produce the finest fret work on the east coast. Prior to the school, Eric served 23 years on active-duty in the USAF and retired as a MSgt in 2011. Eric has degrees in Business, Human Resource Management and Aerospace Maintenance Technology. Eric attended the Eastern School of Fretted Instrument Repair in 2011 and graduated in 2012. Eric received his lutherie instruction from the founder of the school, Mr. Joseph Civitano. After graduation, Eric interned a year with Raritan Bay Guitar Repair and spent 4 years as a Guitar Technician with Guitar Center. Eric is accredited as a Gold Level Fender repair technician and a Silver-Plus Level repair technician with Taylor Guitars. 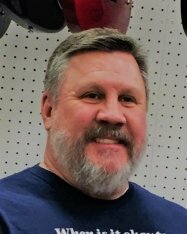 Eric holds repair certificates as an authorized repair technician for Gibson, Epiphone, Guild, Kramer, Jackson, Peavey, B.C. Rich, and Ovation. Both he and all other instructors will take all the time necessary to ensure you fully understand all of the repair techniques and procedures covered in the program. 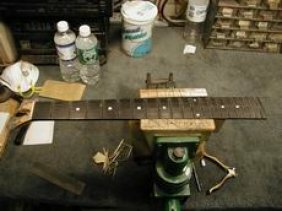 The Eastern School of Fretted Instrument Repair is located in the heart of New Jersey on Route 9 South in Freehold, NJ, centrally located and easily accessible from all points in New Jersey and the major metro locations of both Philadelphia and New York City. The facility provides five feet of work bench space and plenty of electrical outlets for each of the students in our well-lit workshop. It is located on the route for NJ Transit buses, with parking is readily available and free of charge. Between classes, students can unwind in our break room equipped with tables, chairs, a coffee pot, refrigerator, microwave, water cooler, television, VCR, and compact disc player.